A 30-year-old can buy a cover of Rs1 crore for 30 years at a premium of just Rs8,500 - the cheapest available option. Rahul Shah, 30, an IT professional, has three dependants - his parents and his wife. Shah's annual salary of `8 lakh is good enough to support his family, but he is worried. Since he is the sole breadwinner, his dependants could be under tremendous financial stress in the event of his untimely death. Therefore, to mitigate the risk, Shah is considering buying a life insurance policy. However, given that there are over 20 life insurance companies offering a variety of products, Shah is trying to zero in on a policy that would suit his requirements best. Life insurance can be broadly classifi ed into fi ve types: whole life plans, term plans, endowment plans, moneyback plans and unit-linked insurance plans (Ulip). All products come with tax benefi ts of up to Rs1 lakh, under Section 80C of the Income Tax Act, 1961, on the premium paid. Keeping in mind, Shah's family and monetary background, financial planner Hemant Rustagi of Wiseinvest Advisors is of the view that a term plan would be his best bet. The reason is that such plans provide the most cost-effective risk management cover at very low premiums. Term insurance is a life insurance policy where the insured pays a premium at regular intervals(quarterly/bi-annually/annually) and the insurer agrees to pay the benefi ciary or the nominee the sum assured in the event of the insured's premature death during the policy term. But, if one survives the policy term, term insurance would not provide any survival or maturity benefi ts. Of late, however, insurance companies have also come up with term plans that pay back a certain per cent of the total premium paid, if the policyholder survives the tenure. But then why should Shah choose a term insurance policy over other products. Pure term plans are not an investment option, but a means to fi nancially secure the lives of your loved ones and help them meet their lifestyle needs in the unfortunate event of death of the insured. As the years roll by, however, the insurance cover must be revised from time to time to meet the changing needs. According to Rustagi, going forward, Shah should go for a `1 crore cover, but consider revising it upwards if a child comes along. Unfortunately, there are no easy answers because the right amount is always a moving target. Depending on where you are in your life stage, the target may keep changing and, at some point in time, you may be in a position where you would not need life insurance at all. However, the thumb rule, according to most fi nancial planners, is that considering rising infl ation, the appropriate cover should be 10 times your annual income. Remember that an inadequate cover defeats the very purpose of buying the insurance in the fi rst place. At the same time, you must not be over insured. Considering 60 years as the retirement age, the policy should ideally run for the entire duration till the time you retire. For example, Shah should buy a term plan for 30 years (i.e. 60 - 30 (his present age)), to ensure his family will have the much-needed fi nancial cushion to fulfi l their fi nancial needs and obligations in the years ahead, in his absence. The premium for a term plan is relatively lower than all other insurance plans because there is no investment element in the amount insured. 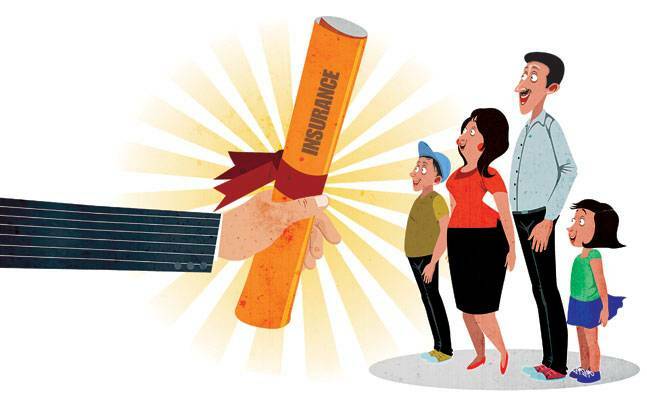 According to an online insurance aggregator, a 30-year-old can buy a Rs1 crore cover with a policy tenure of 30 years for an annual premium of around Rs8,500 - the cheapest available option to claim a large cover. In fact, by paying just 1 per cent of his annual salary, Shah will be getting a life cover of Rs1 crore. Generally, claim rejections are lower if the policy has been active for 10 years or more. Shah can buy a policy from any company, but he must make complete disclosures about his health, habits and fi nancials to ensure his family's policy claim is not rejected in the event of his death, says Rustagi. Recently, the Insurance Regulatory and Development Authority (IRDA) has mandated that two years after the policy comes into effect, no insurance company can reject a claim stating non-disclosure of facts. When it comes to term plans, fl exibility is one of its many advantages. You can opt for an online or an offline plan. Also, for many online policies, companies do not insist on health check-ups if the cover amount is less than or equal to Rs50 lakh. One has to just give a declaration during the application process. Even though Shah will not be able to increase the sum assured during the renewal process, he can always opt for a new plan, as and when the need arises. Besides, he can customise a term insurance with optional riders without altering the simplicity of the term plan to provide additional protection to his family. Term plans come with a host of riders which provide extra benefi ts at a nominal cost. Accidental death, permanent or partial disability, critical illnesses, waiver of premium and income benefi ts are some of the available options. There is no set rule as to who can avail a plan. It all depends on one's needs. For example, if someone works on the fl oor in the heavy industries, a waiver of premium or a permanent and partial disability cover can be explored. Experts say one should not buy a rider just for the sake of it because they come at additional costs. The rates vary from company to company and, therefore, one has to read the fi ne print carefully and watch out for the exclusions. When you buy an insurance policy, the commissions charged by brokers or agents are mentioned under the premium allocation charges. This is a recurring expense. Each time Shah pays his premium, a certain per cent of that money goes to his broker or agent. This percentage would vary from one insurer to another and from plan to plan. In terms of certain term insurance products, the brokerage could be as high as 30-40 per cent of the fi rst premium paid and, thereafter, over a period of time the brokerage cost decreases. However, for term plans the brokerage element is the least and comes at an average of around 5-6 per cent, according to financial planners. Most importantly, however, if one were to go for an online term plan, brokerage cost would be nil. Given the uncertainties of life - the not-so-safe roads we travel on or other lifestyle hazards in these days and times - a term plan can save you from a lot of worries by securing the lives of your loved ones. So, buy one before opting for any other financial product.